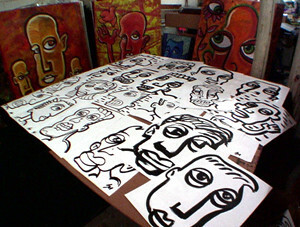 The photos above depict the 30 or so drawings and paintings I created during the course of an afternoon. Some were painted with a brush and acrylic paint. Others were created using a black marker. 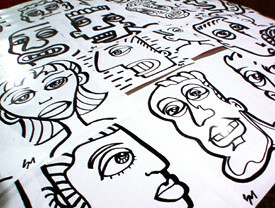 The intent is to place these original works of art in public places throughout parts of south west Michigan. Why? The premise is simple, art should be accessible and finding art in unexpected places is a unique experience. My hope is people will find these original works of art and send comments and/or photos (via email) of what they did with their found art. Some of the results will be posted here. (The "Finders" will know how to contact me by way of a note placed on the back of each piece). Should the project be successful I'll be posting selected highlights of the experience here. Good work and good concept. I can't wait to see what happens. Thanks. Hopefully it'll be a positive experience. I'd love to see you take on the concept. Any chance that you might go guerilla too? ...I'd love to but <insert excuse here>. Guerilla Art Project - "The Unleashing"